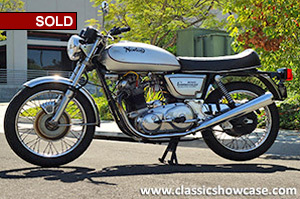 (SOLD) An unrestored, all original, matching numbers 850 with original paint and chrome. It is in very good condition, runs great and has an electric start. This Commando has been well maintained and cared for. It is hard to find survivor bikes that are all original. For the collector that is looking for originality and an unmolested bike with patina, this is a great addition to your collection.